Grand Theft Auto Vice City Poster. Condition is New. Shipped with Economy Shipping. This is a very rare item. Very sturdy. They have been sealed but only opened to verify the quantity. I have two choices for the second side. You can choose the side with character Franklin or the side the the blonde girl character. 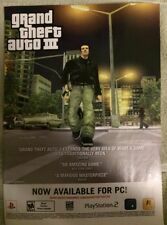 For sale authentic Rockstar Games Grand Theft Auto IV Wanted Posters for Vladimir Glebov. This is a very rare item. The poster measures 11x17 and is made of thick cardboard. Very sturdy. They have been sealed but only opened to verify the quantity. All posters are in excellent condition. These will be shipped in poster tubes and can ship within 24 hours of payment confirmation. Shipping is free. A tracking number will be sent for verification. Let me know if you have any questions. Grand Theft Auto: Vice City Stories (Sony PlayStation 2, 2007). Disc is in good working condition. Comes with double sided poster. Has Slight bend on one corner. 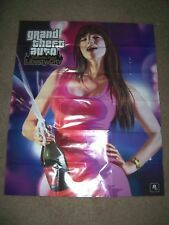 Grand Theft Auto III 3 Double-Sided Poster & Map Official Rockstar Liberty City. Condition is Used. Shipped with USPS Item little to no damage, Near mint! 21.5 x 26.5 GTA San Andreas. 13.5 x 21.5 GTA Vice City. 13.5 x 21.5 GTA III. 18 x 28.5 GTA IV - Ballad of Gay Tony. 21.5 x 28 GTA V. Iconic Collection. 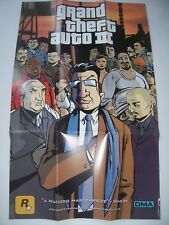 Grand Theft Auto San Andreas Poster. Condition is New. Shipped with Economy Shipping. 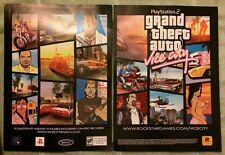 Grand Theft Auto: Vice City Stories (Sony PlayStation 2, 2007). Condition is Good. Shipped with USPS First Class Package. GTA GRAND THEFT AUTO 5 V LOS SANTOS XBOX 360 MAP ONLY - PERFECT! GRAND THEFT AUTO V (GTA V)MAP FOR THE CITY OF LOS SANTOS. This is from a gaming magazine. Condition is Like New. GRAND THEFT AUTO V.